It might be small, but the big features could attract a new generation of Mackie lovers. Simple intuitive control interface. Fully packed feature set. Solid, clutter-free build. Remote control. Build a little plasticky. No individual/bank phantom power. Sounds are a little uninspiring. It's nearly 25 years since Mackie raised its flag when it introduced the CR1604, setting a precedent for its range of well-built, value-for-money audio hardware. While many of its offerings may lack some of the features old pros are used to, they're more than good enough for the majority of semi-pro users, and very popular with bands that mix themselves. "The DL1608 brings some slick new technology to the market, adding remote control to an increased set of features"
The DL1608 brings some slick new technology to the market, adding remote control to an increased set of features. In the box you'll find a slightly boring looking black plastic box, with a row of connectors and gain pots. It feels nicely solid in construction, although the adaptor tray necessary to accommodate different versions of iPad, makes it feel a little 'plasticy'. You'll find an iPad-sized quick-start guide in the docking slot, reminding you that this isn't a standalone mixer, however, this reliance on the iPad as a control surface gives the DL a distinct advantage over many low budget mixers - the control surface is a user changeable part so a spare is now possible! Sliding the required iPad into the dock obviously makes it look more interesting and there's a chunky lock to prevent theft. It was disappointing to see a global phantom power switch. A good compromise would have been to switch in banks of four. It's also a shame that the input gains are physical pots with no digital recall, giving no remote control or proper use of scene presets for multiple bands. We'll still be using our digital camera to 'note' pot settings between bands, on a digital desk. In fairness, though, both of these details keep production costs down, and shouldn't be a problem in most real-world situations. The DL1608 comes with an external power brick, which might be annoying to some, but reduces the noise floor. We were surprised to see a lack of integrated soundcard or digital in/out and CA phono input and output. Playback and recording can be achieved when the iPad is docked directly to the DL1608. The manual is pretty clear, but full of weird humour (although not quite as weird as the promo video!). "The Master Fader software can be downloaded free from the iTunes App Store - handy if you want to get a feel for it before purchasing"
The Master Fader software can be downloaded free from the iTunes App Store (which is handy if you want to get a feel for it before purchasing). After following the setup guide, when we tried to connect a warning prompt said the DL's firmware needed updating. The preamps seem fairly good sounding, although a little noisy at extreme gain ranges. The EQs work, but it sounds like it's not affecting the audio as much as the gains may indicate. Not a problem for most, but those who are more used to the top end mixers might notice this. The compressors sounded a little crunchy for our liking. They give a hard/ soft knee switch, but this reviewer likes to use RMS sensing on comps, so we were disappointed not to see this option. The FX sounded okay, but a bit limited, and there were no FX sends from returns, so no reverb on delay returns, which we often use, and no delay feedback effects, which is fairly often done on Reggae shows. Overall, we found the sound of the DL a little uninspiring, but the functionality it offers means you can get the job done pretty well. We loved the ability to add an image to the track name. It can be a struggle to remember the names of the 12 singers you've only just met, who keep moving around, making it tricky to track who is on which channel. The images are not affected or changed by scene recalling, but can be attached to track presets. "For small gigs, having wireless control is a godsend: no need to run out a multicore, you can mix a show from a comfortable chair at the back of the pub"
For small gigs, having wireless control is a godsend: no need to run out a multicore, you can mix a show from a comfortable chair at the back of the pub. If your iPad battery dies, or the software locks up - which it did once during testing - the audio engine will continue exactly as it was until you charge back up or force quit and restart. It's worth having two iPads, because if you want to record then you have to have the iPad docked, which means you'll lose remote control. 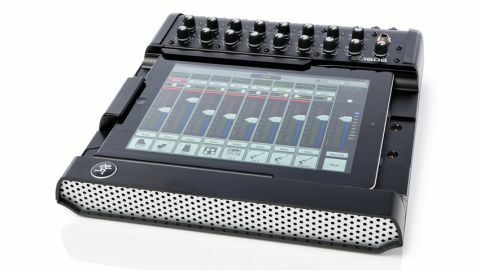 Bands will also love being passed the iPad to adjust their own monitor mixes, although not all engineers will enjoy letting musicians loose on their mix and there's no way to lock out Master Fader features so you could find musicians playing with your EQs. As with any digital mixer, it's a really good idea to keep saving to scenes. The good lessons are hard lessons, but they don't have to be your lessons - learn from other people's mistakes. Having compressor/limiters on the outputs is great for protecting your speakers, although it's a shame there's no delay compensation on outputs, or indeed inputs for that matter. As yet there's no way to digitally buss two DLs together as one. Mackie suggest making a 24-channel console, by taking the analogue outs of one DL and routing into eight inputs of the second. This would work, but adds extra D-A/A-D conversion and latency (which could have been compensated by an input delay trim). It would be nice to see digital bussing of two DLs using the 100Mb networking port, especially if the software then saw the two consoles as one big system. When we're quoting for a job, we like to remind clients we can do anything cheap, fast and well, as long as they only want two of the three. The same is true for manufacturers, but their three goals are price, audio quality and functions/build. Historically, Mackie has erred on the side of keeping costs down, while producing reasonably good audio quality and functionality with a pretty chunky build, and there are as many low budget users that love them as there are high budget users that don't. The DL could be the product that readdresses that balance, attracting professional users who love its functionality, as well as the small and medium-budget users who would traditionally have been drawn to its reasonable price.